Researchers are trying to harness glucose-the body's own fuel-to power implantable gadgets such as pacemakers. LIKE any other electrical device, a pacemaker needs a power source. Since the first permanent pacemaker was installed in 1958, manufacturers of implantable medical devices (IMDs) have tinkered with many different ways of supplying electricity to their products. A variety of chemical batteries have been tried, as well as inductive recharging schemes and even plutonium power cells that convert the heat from radioactive decay into electricity. Plutonium-powered pacemakers still turn up from time to time in mortuaries and hospitals, and a failure to dispose of them properly keeps America's Nuclear Regulatory Commission busy handing out citations to unsuspecting hospitals. Today, non-rechargeable lithium-based batteries are common. Used in many cardiological and neurological implants, they provide between seven and ten years of life. That is more than enough: the speed of medical progress is such that by the time the battery has run down it is generally time to replace the whole device with a newer model in any case. But that has not dissuaded researchers from continuing to seek perfection, in the form of a compact, perpetual energy source which does not require external recharging. Now, several researchers are closing in on just such a solution using glucose, a type of sugar that is the main energy source for all cells in the body. Many other ideas have been tried down the years. The kinetic energy of the human body, for example, has long been harnessed to power watches, and should also be enough to keep a pacemaker ticking. Temperature differences between the body and the ambient air mean that thermoelectric couples can generate useful quantities of juice. A properly tuned device could capture background radio-frequency energy and rectify it into small amounts of usable power. Although all these ideas have been shown to work in theoretical tests on lab benches, they all suffer from the same handicap: intermittent operation. Unconscious patients, for instance, generate little kinetic energy. Sitting in a warm room reduces the power available from thermocouples. And radio waves are common but not ubiquitous. These are serious drawbacks for an IMD that may be responsible for keeping someone alive. A glucose-powered implant would solve such problems. Glucose is continuously delivered throughout the body by its circulatory systems. A sugar-powered device would therefore have access to a constant supply of fuel, and could be implanted almost anywhere. One approach, which has been employed by Sameer Singhal, a researcher at the CFD Research Corporation in Alabama, involves the same enzymes that break down glucose within a living cell. Using carbon nanotubes, he and his colleagues immobilised two different enzymes on the electrodes of a fuel cell, where they generated electricity by freeing electrons from glucose. At present, only two of the 24 available electrons in a single glucose molecule can be harnessed, but refinements to the technology should boost that number. Dr Singhal has implanted prototype devices into live beetles. Fitted with a fuel cell about the size of a penny, the bionic bugs were able to generate over 20 microwatts (20 millionths of a watt) during a two-week trial. That is only around a fifth of the power that a pacemaker requires, but Dr Singhal reckons that a human-sized version of his cell would be able to deliver enough juice. There is a catch, though: a process called biofouling, in which foreign objects implanted in the body become encrusted with proteins and tissue. That could render Dr Singhal's device inoperable after only a few months. Equally worrying are the enzymes, which tend to break down over time. Losing enzymes means losing power. Rahul Sarpeshkar, an electrical engineer at the Massachusetts Institute of Technology, has a solution to both these problems. In a paper published on June 12th in Public Library of Science, Dr Sarpeshkar and his colleagues describe building a glucose fuel cell which uses a platinum catalyst that does not degrade over time. The downside is that platinum is a less efficient catalyst than the enzymes used by Dr Singhal, and so Dr Sarpeshkar's cell works less well. But it might be able to generate enough electricity to run the next generation of ultra-low-power IMDs. Dr Sarpeshkar also has a novel solution to the biofouling problem: implant the fuel cell in the cerebrospinal fluid (CSF) surrounding the brain. Although the CSF has only half the glucose concentration of the bloodstream, it is virtually free of the proteins and cells which would foul a device implanted in other areas of the body, and thus its life would be greatly extended. Other approaches could yield more energy. Some soil-dwelling bacteria have evolved to deposit the electrons from glucose oxidation onto iron molecules, which allows researchers to trick them into living on the anode of a fuel cell. A colony of microbes like these, properly isolated from the host's immune system, might be coerced into trading electrons for nutrients from the bloodstream. The bacteria can renew their own enzymes, so such a system should last indefinitely. But the idea of implanting a bacterial colony into a patient might be a tricky one to get past medical regulators-not to mention public opinion. A better idea might be to retrain some of the body's own cells to do the work. 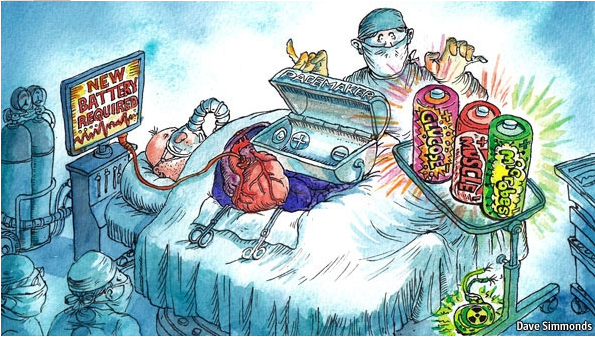 Just as an outdated procedure called a cardiomyoplasty involved severing a seldom-used upper-back muscle and wrapping it around the heart to assist in pumping blood, muscle fibres might be retrained to crank an electromechanical generator. Such a setup would be capable of producing enough electricity to drive even the most power-hungry of devices, like artificial hearts. The energy density of lithium batteries has come a long way in the past few decades, but the chemical reaction on which they rely will never be able to match the energy available from the metabolisation of glucose. The chemical energy in a gram of glucose is nearly half the amount available from petrol, a famously energy-dense fuel. With a bit of refinement, sugar could prove a very sweet solution for powering the next generation of IMDs.